55 wind turbines with an total installed electrical capacity of 122.6 MW are operated by Energiequelle GmbH, as is the separate power grid. Like almost all forms of energy, wind energy is ultimately derived from solar insolation. Approximately two per cent of the incident solar radiation falling on the earth’s surface is converted into air movement. In pure arithmetic terms, the amount of energy contained in wind would be sufficient to cover global primary energy needs several times over. 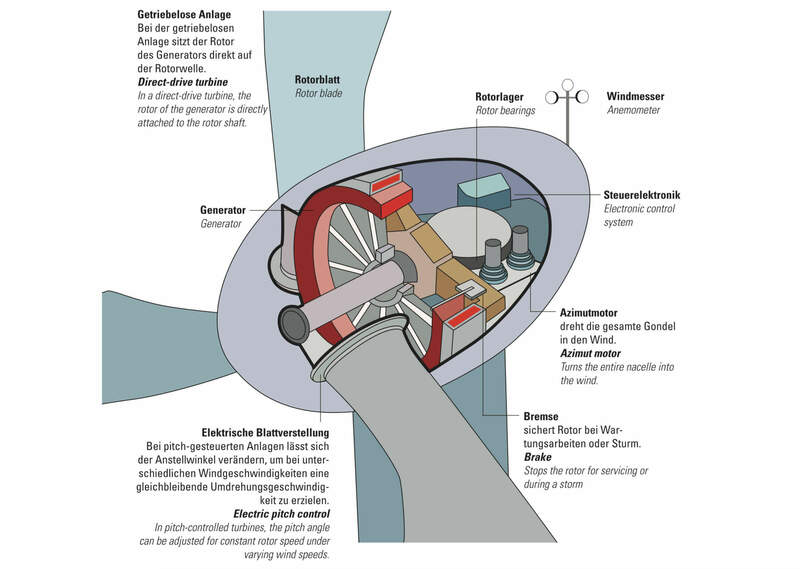 As at the end of 2009, Germany had a total of 21,164 wind turbines with a total power capacity of 25,777 MW, which means that wind energy occupies a dominant position among renewable energies in the field of electricity generation. Wind energy currently accounts for a 7% share of total electricity consumption in Germany. More than 30 million tonnes of CO2 emissions were mitigated in Germany in the year 2008 alone as a result of wind power generation. The aims of the federal government are for the share of power generation with renewable energies to increase to at least 30% by the year 2020, with further continuous increase in the years thereafter. Wind energy will play a key role in this endeavour. Independent surveys by the leading opinion research institutes, Allensbach, Emnid and forsa, have shown that a large majority of the population have an extraordinarily positive attitude to wind energy. 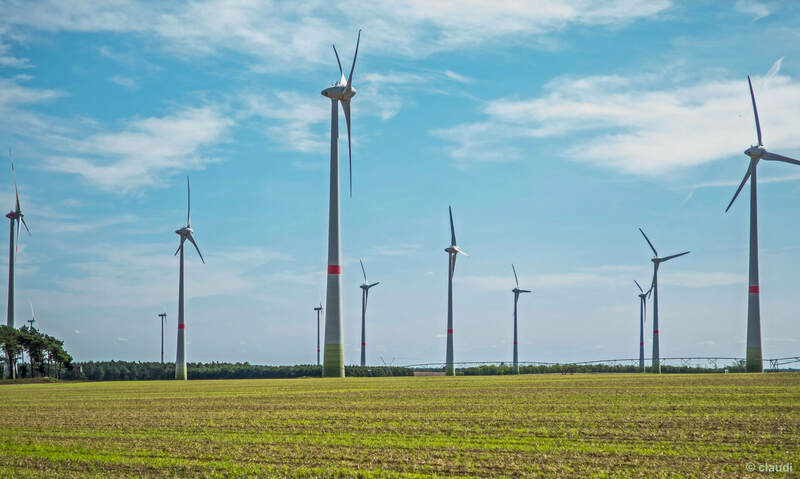 majorities among voters for the Green party (85%), the Social Democrats (80%), the Liberals (63%) and the conservative CDU/CSU parties (63%) are in favour of exploiting wind energy. Conventional power stations consume large amounts of primary energy during construction alone. Their energy balance can never turn positive, even when their operation requires a constantly supply of fossil fuels. The situation is different for wind turbines. Once they have been installed, the freely available wind is the sole source of primary energy. Depending on its location, a wind turbine needs between three months and a year to “give back” the energy required to build it. In the course of its average service life, a wind turbine produces 40 to 70 times as much energy as was used to make it, use it and dispose of it. In 2013, the wind energy industry in Germany was a source of employment for around 137,800 people. The planned construction of offshore wind farms in the North Sea and the Baltic may create additional jobs in the coastal regions. More jobs will also be created for servicing and operating land-based wind turbines. In terms of job creation, wind energy has long since overtaken the coal and nuclear power industries. Wind energy is an opportunity for structurally weak regions. Throughout Germany, many small municipalities and their inhabitants benefit in several respects from having their own wind farms. Such projects generate work for local tradespeople as well as municipal trade tax revenue for local government. They boost purchasing power at local level and bring rental income to the owners of local wind energy sites.